Summary: I extended a Peak District classic by continuing from popular Dove Dale through Milldale into impressive Wolfscote Dale. I enjoyed a superb journey deep through these two most beautiful Dales before emerging out of Wolfscote Dale and then returning over higher ground to Alstonefield and then to Stanshope before following Hall Dale back into Dove Dale and then climbing out over more high ground back to Ilam. The summer was over, a slightly disappointing one in terms of settled weather so it was even more pleasing that I got the opportunity to do an Autumn walk in the Peak District in such beautiful conditions as they were on this day in mid October. I was in the Peak District while my wife helped her son decorate his first home in Upper Tean near Leek. I am more a hindrance than a help when it comes to decorating so I was enthusiastically shuffled out of the house to go walking! It was a cloudy morning as I drove into the Dove Dale area but the forecasters had been hopeful in promising a good day. They were not to disappoint. Even though it was the 9th of October the trees were still in full splendour and only just showing the first signs of autumnal change. We seem to get more unpredictable weather in England these days but then the Spring, Summer and Autumn seasons do seem to be prolonged at the expense of shorter winters. I am not complaining, this mid October day was as good as any in Summer. The sun had really broken through as I arrived in Ilam and prepared myself for the walk. I had never walked through Dove Dale before, always put off in the past by the crowds of people who mass to this beautiful place in the tourist season. The walk through is by far the most popular walk in the Peak District and I was soon to find out the reason why. When I drove into Ilam there was already a steady procession of cars entering the village and as I changed to walk others did the same. 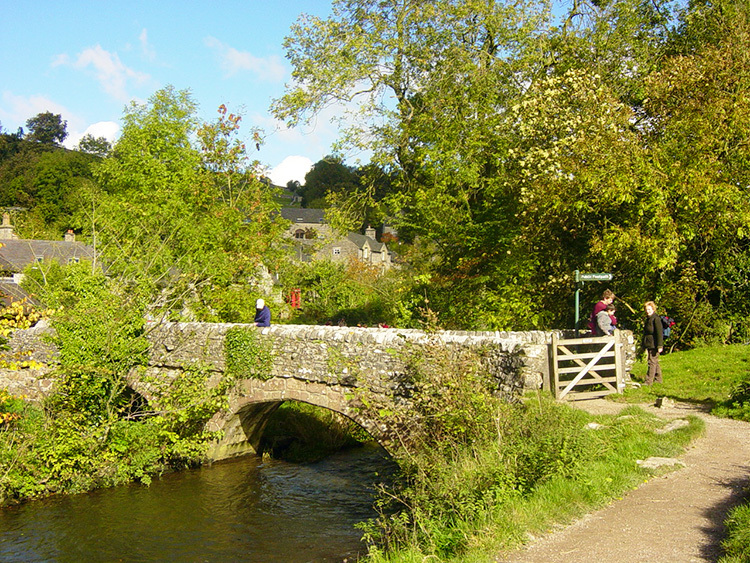 I set off by walking through this most idyllic village with its attractive Alpine style cottages and then along a road following the River Manifold downstream until I reached a gate which took me across open fields and past Izakk Walton's Hotel towards Dove Dale. The scenery was already impressive as I looked to Bunster Hill on my left. Soon I descended into Dove Dale itself at a large car park which no doubt is crammed full of vehicles in high summer. There were quite a few scattered around the vast car park even today. I continued on into the Dale. 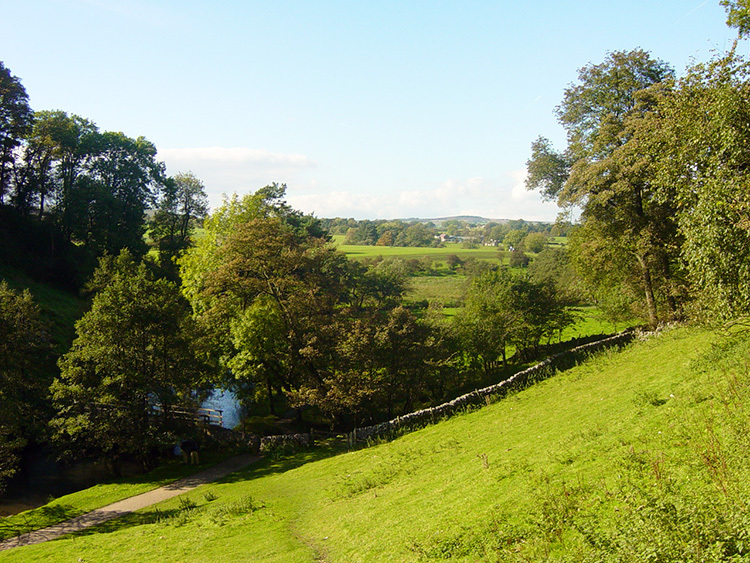 It was not long after entering the Dale that I appreciated the attraction of the place. As soon as I got down to the River Dove Thorpe Cloud closed me in to the west as did Bunster Hill now to my east. I continued along this deep avenue looking at the valley floor and the stunning limestone outcrops above me on either side in equal measure. There was already so much to please the eyes and it was soon going to get even better. I rounded a corner with a stepping stone crossing where a young girl adventured. 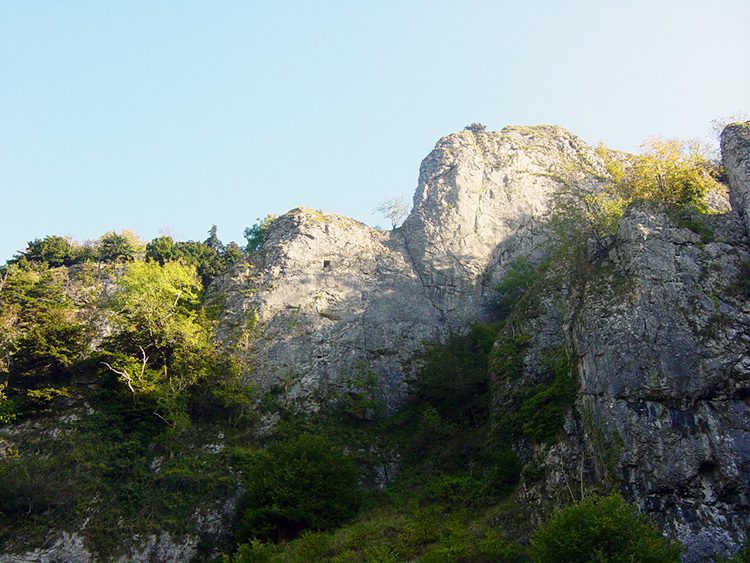 This was Dovedale Castle so called by the high limestone angled wall on the bend. After the bend the valley floor got even narrower. I was walking into some spectacular scenery. I had not walked far when my eyes were drawn up to the impressive limestone features called Tissington Spires. 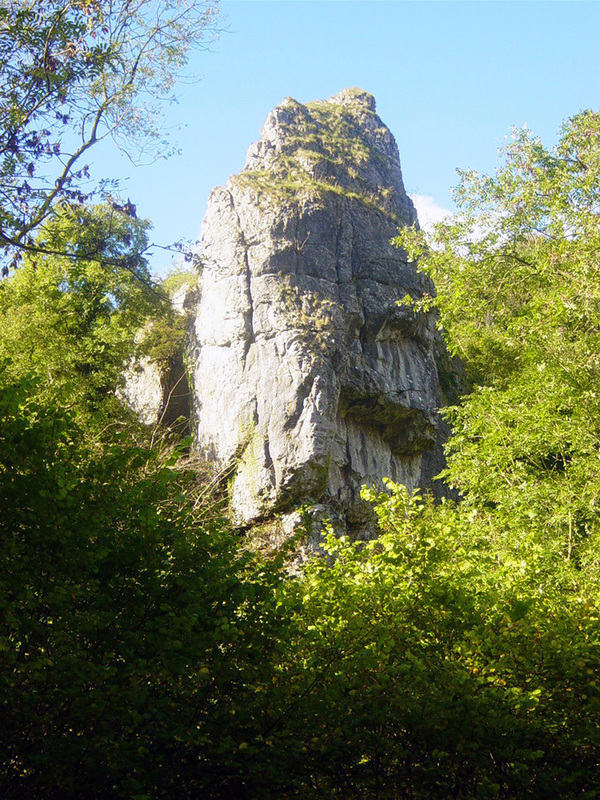 These impressive pillars are a favourite spot for rock climbing in the Peak District. Easy to understand when you have seen them, they are something special. I walked slowly past the Spires so as not to trip over as I spent my time peering upwards and not where I was going. After the Spires I spent the next half mile walking close to the river, sometimes having to shuffle past other walkers on the narrow path. It may have been October but it was still busy with walkers as I strolled in majesty along Dove Dale towards my next incredible highlight of the walk. As the narrow section opened out slightly my eyes were drawn to the far side of the River Dove. There was a finger pointing upwards to the sky. 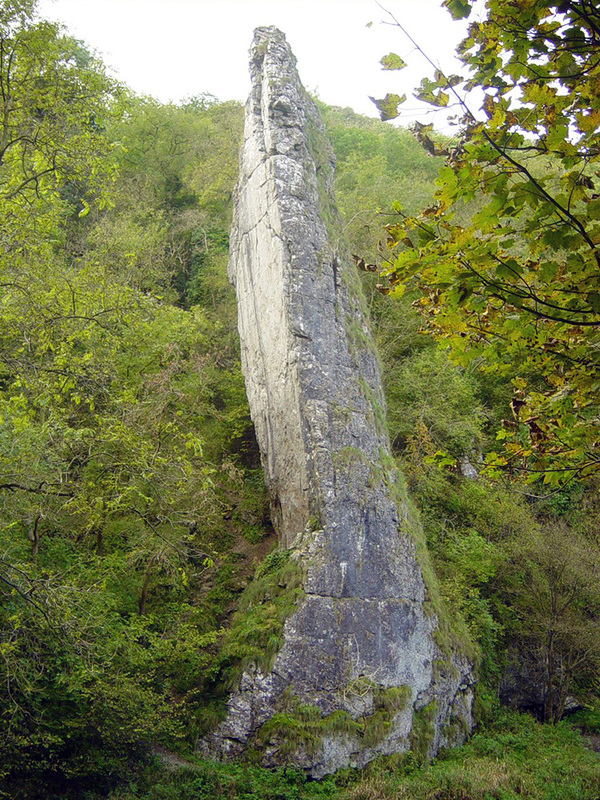 As I got closer this white limestone finger became the more impressive. I was coming to Ilam Rock. The rock is a most magnificent pinnacle. As I first approached it looked super as it poked out through the tree line but it was to get even more outstanding as I drew alongside for it is a narrow imposing pinnacle when looked at side on (see pictures) and being so offers another challenge to the rock climbers in the area. I personally think they should leave this one alone as erosion will eventually cut its majestic standing somewhat without the added damage done from climbers and their tools of the trade. 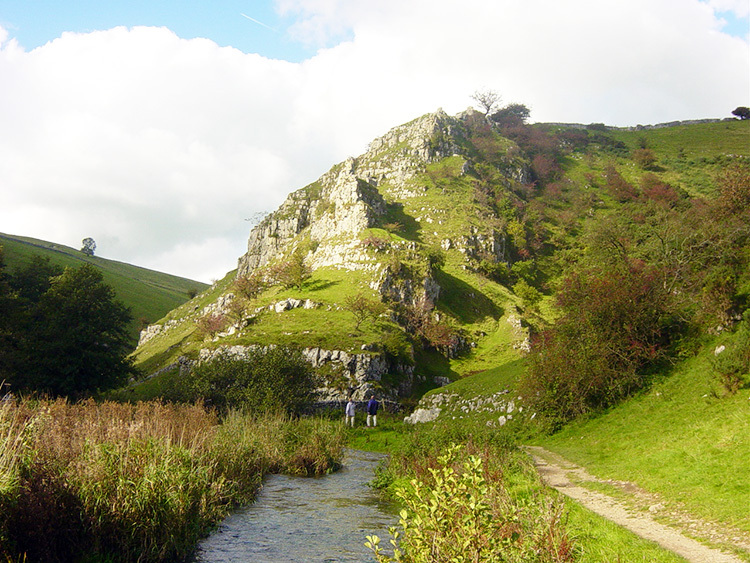 Tissington Spires are more robust, Ilam Rock needs a little more consideration so future generations can enjoy the sight I had witnessed. With the blue sky above me the limestone features stood out more vividly. It was an awesome passage through Dove Dale in such conditions. Soon after Ilam Rock I arrived at the Dove Holes caves. 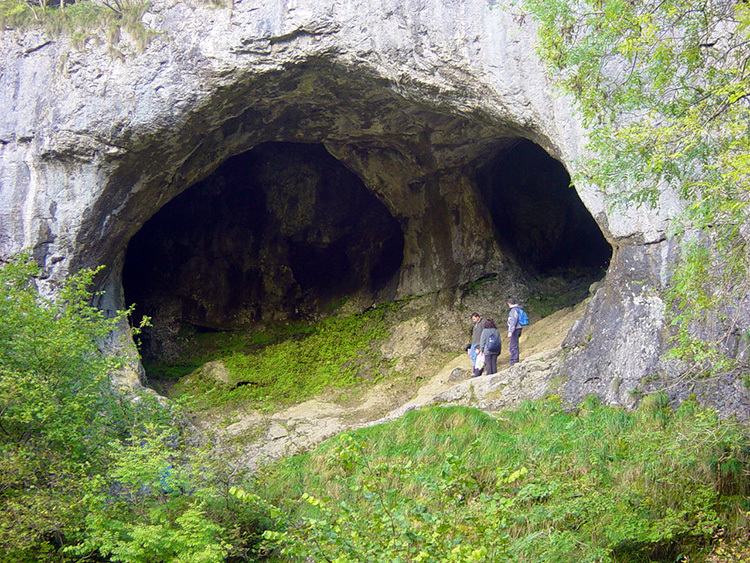 Here families and children enjoyed exploring inside although none of them were as impressive as Thor's Cave. They were more accessible though and convenient to be investigated. After passing Dove Holes the best of Dove Dale was behind me. The valley opened out the point Hall Dale and The Nabs converged with Dove Dale. I was to encounter Hall Dale later in the day but for now I walked on following the River Dove upstream to the quaint village of Milldale. At this lovely place I took a break and bought a most fairly priced cup of tea to enjoy with my first sandwich. As I did so I took time out to reflect on the walk so far and plan the next stage. I had planned to follow the River Dove further upstream into Wolfscote Dale and as I felt good I saw no reason to change my original plan. And so after my refreshments I followed the road from Milldale to Shining Tor and Lode Plantation where I left it to enter Wolfscote Dale. Once more the sides of the valley began to close in as I walked along the riverbank. At one stage I had to slow down as I found myself behind a group of about a dozen female walkers. Not that they were being slow, it was my misfortune I met them at a stile where crossing it was single file. After half of them had passed over the stile they took pity on the solitary male and ushered me on. I thanked them and continued my walk. 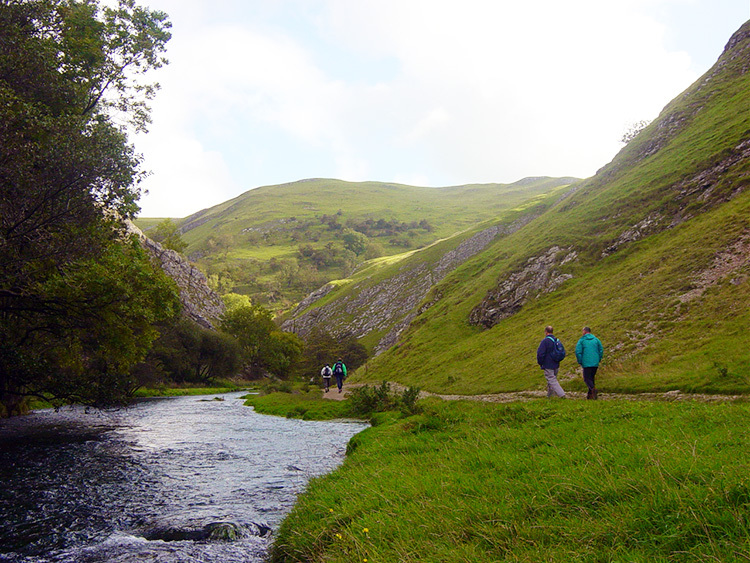 While not as awesome as Dove Dale the walk though Wolfscote Dale had its spectacular interludes too. There were more impressive limestone cliffs to enjoy. A particular highlight was Iron Tors. 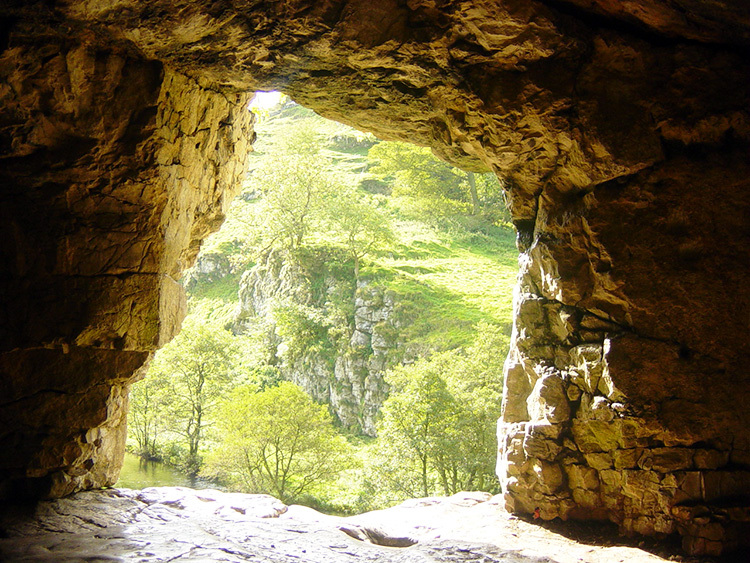 At the end of Wolfscote Dale I spotted a cave about 50 metres up a hill. It was too inviting to ignore and although it was small inside it was dry and the most wonderful place to stop for my lunch. I had walked though two great dales in about six miles and had worked up an appetite. I thoroughly enjoyed lunch in my cave and enjoyed the scenery. So far during the walk I had been in the company of other walkers and on many occasions had shared a conversation with them. Now I had completed the popular sections I was not going to talk with people any more for there were all gone! It was surreal for as soon as I finished my caveman's lunch and walked out of Wolfscote Dale the people disappeared. As I walked over fields along a path to Narrowdale and around the fringe of Gratton Hill another subtle change took place. The people were gone and the clouds rolled in. They were not threatening though just enough to hide the sunshine. 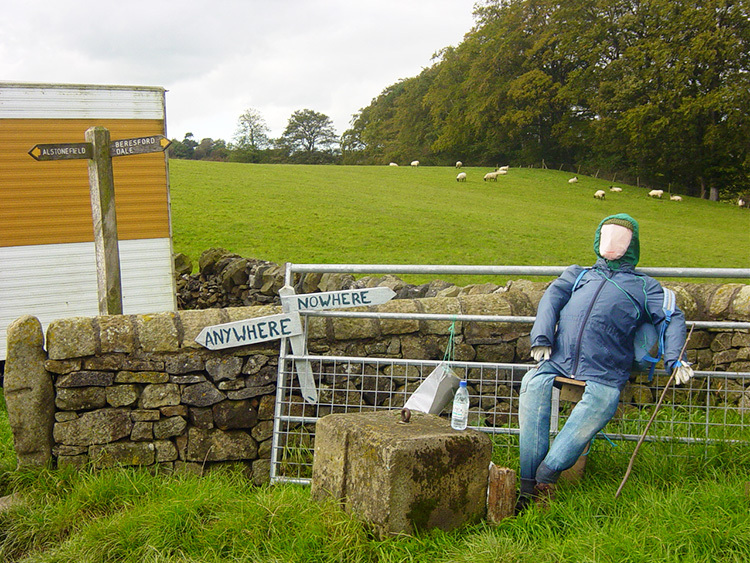 Even though the people had disappeared I did meet a Guy at Narrowdale who pointed me in the right direction (see picture, above right) as Anywhere was better than Nowhere! 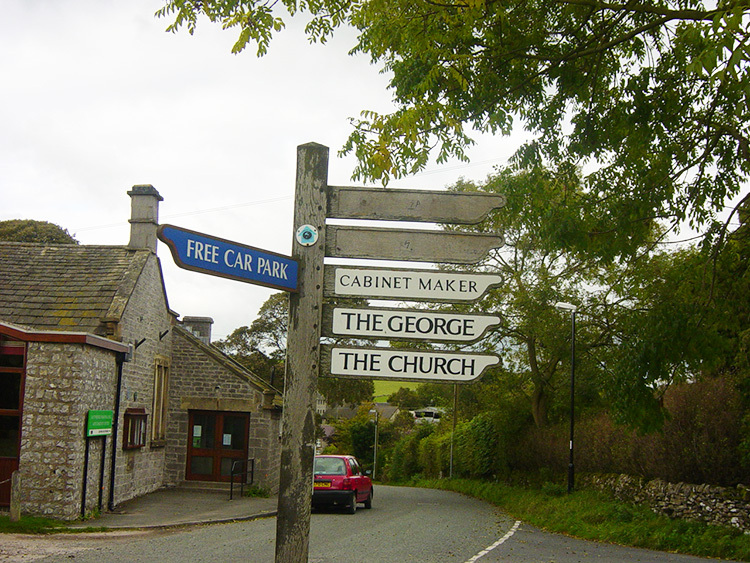 This pointer took me over rolling peak-land to the village of Alstonefield where more signs (see picture, below left) aided me further on my walk to Stanshope, the next village on my route. 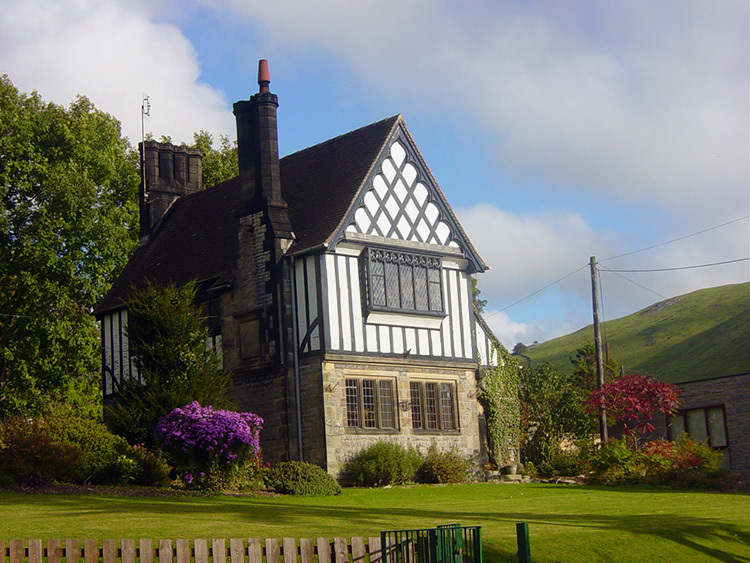 I was tiring a little now and wanted to get back to Ilam. There was still more work to be done though and I headed off to Hall Dale which was to lead me steeply back down into Dove Dale. I did not fancy the steep climb out that was facing me but I was not taking the only alternative by road. As it turned out the walk down Hall Dale was pleasant if a little steep at times and I slipped on scree due to my tiredness more than once. It had to be done though and I was soon down in Dove Dale once again. 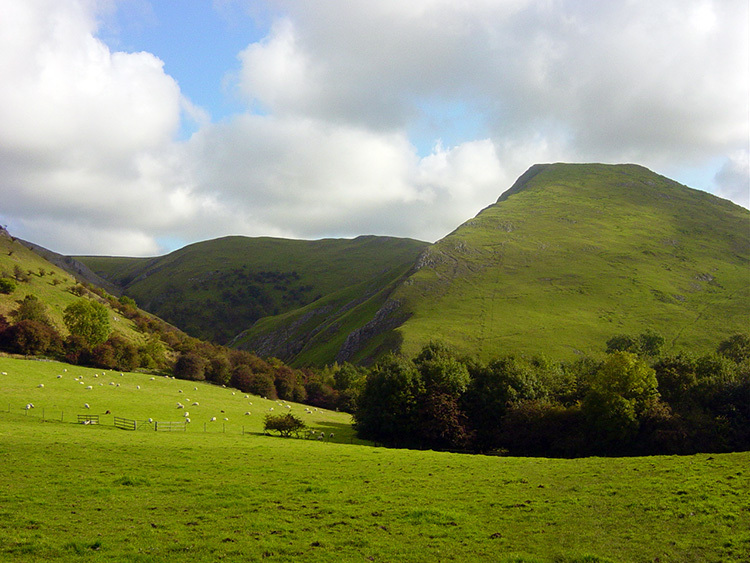 After about 400 yards I arrived at Ilam Rock but did not linger as I was now fatigued. 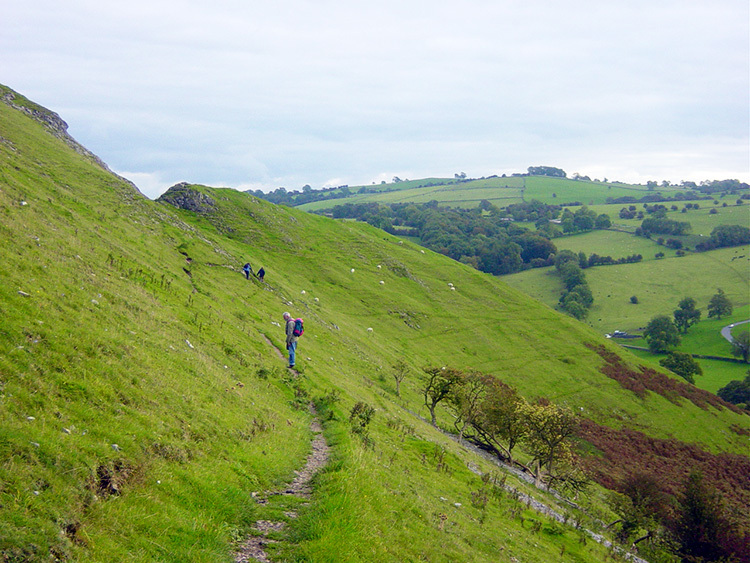 I climbed steeply in short sections out of Dove Dale through the trees of Dovedale Wood and eventually emerged into open ground. I was puffed out on the climb but as soon as I had regained my breath I walked a level path by the woodside to Air Cottage and then to Iilamtops Farm. From the farm I followed a track towards Bunster Hill. Finally I could see the village down below me. It was a steep descent off the hill which I made cautiously but with some haste until I reached the bottom at Home Farm Pond. It was easy walking back into the village. Just as well as the climb down had been tiring and I was certainly feeling the rigour of the walk now. I would not have changed anything though. It had been a most brilliant walk and one I will always treasure in my walking memories. I am glad I have finally walked the Dove Dale trail. Fantastic. Oh, I nearly forgot. Back in Upper Tean my wife and her son had done a super job with the decorating. Well done!